In the case of any small fire, first aid fire fighting equipment in the form of portable extinguishers is the first line of defence. If used correctly, these units would prevent a fire from spreading and destroying property and would save valuable lives. 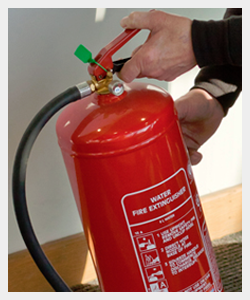 The importance of having correctly installed and maintained extinguishers cannot be stressed. IFS can assist you to ensure your premises meets all the fire regulations regarding the number and type of fire extinguishers required. All of our staff and have been trained to the highest standards and we only sell extinguishers that are manufactured to correct manufacturing standards so that you can be assured that they operate when you need them most. We offer a fully tailored service to businesses and organizations alike, from design, installation and through to certification, all with a full warranty for extra peace of mind. We offer before and after sales advice direct to both contractors and end users alike. IFS can manage every aspect of your portable extinguishers installation, from free and impartial advice when chosen what product best suits your requirements, from the installation and all the way through to service & maintenance of the equipment installed. We are also members of F.I.A.I (Fire Industry Association of Ireland), which demonstrates we are committed to providing all our services to the current fire extinguisher standards the IS291 2002, and also which ensures that all work meets the requirements of all FIAI registered companies.